Another year of KC Diva Spring Feeva is in the books. Memories and friendships were made that we hope will last for years to come! You had to be there to fully understand the experience of this one of a kind women’s event but check out our video below that captures some of the energy of Diva Feeva. Thank you again to all our SPONSORS and VOLUNTEERS for making this event possible! We are proud and honored to host this event in Kansas City and partner with the best disc golf club in the country, the Kansas City Flying Disc Club. 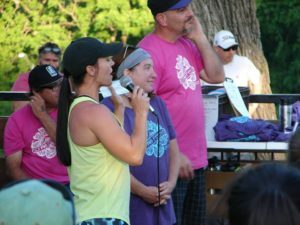 The Kansas City disc golf community has been behind this event from it’s inception and many look forward to it all year. From monetary and product donations to resources, supplies and an overwhelming number of volunteers and spectators, you are the wind beneath our wings! Perfect spring weather, beautiful and talented ladies, supportive gentlemen AND DISC GOLF! We had quite a bit of rain here in Kansas City leading up to this event but we could not have asked for better weather the entire weekend. We kicked off on Friday and celebrated with a doubles event followed by a fun happy hour theme. It was hugs and high fives throughout the day as players, caddies and volunteers arrived. The great weather brought out a record 58 teams to play in the Spring Feeva Dubs. Happy hour with a complimentary taco bar and beer was a hit. Music and more gathering, chatting and fun times through the evening. Saturday morning it was go time and the atmosphere and energy continued. Here are a few highlights. Jennifer Allen competed in Diva Feeva for the first time this year and with an amazing score of 48 in round 1, helped her ultimately take home the win. We had an extremely talented field of 13 Open women including our 2016 champion, Paige Bjerkaas. For our Junior divisions this year, we tried something new. With feedback from one of our local juniors, we designed a junior course within the main course layout using temporary tee pads. It was a shorter version but still had some challenging shots. These girls are so adorable together and inspiring to watch. 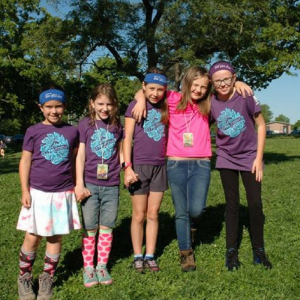 Keep your eye on these young ladies in the future! As is our tradition and how we roll here at KC Diva Feeva, the ladies were greeted with Roses and Mimosas as they came in from round 2 and cards were turned in. Naturally there were a few ‘technical difficulties”. For example, the CTP flag did not make it out during round 2 for the AM divisions. 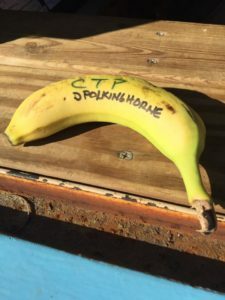 Leave it to a group of women to find a solution and not make that a big issue – they used a banana instead. Debbie Polkinghorne was our first Banana prize winner! The after effect ripples that this event creates is still happening! The ladies leave super-charged and on fire to get back home and get ladies together to play. 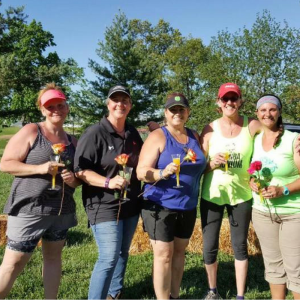 We’ve seen posts from other women’s disc golf groups and leagues already making plans – love it! Shout out to all the ladies that returned to KC Diva Feeva this year and brought their friends! That’s what keeps this event growing. Remember, the 2018 KC Diva Spring Feeva will also be a participating PDGA Women’s Global Event (WGE) and we hope to accommodate up to 144 women competitors! We appreciate all the kind and encouraging words we’ve received. We welcome all feedback so please feel free to share your comments below. Hope to see you all here in Kansas City in May 2018. Are you interested in joining the PDGA? The Heartland Women’s Series has a special promo code you can apply to get a 20% discount. Contact me here for details. Let’s all try to support the ladies events and leagues in our new Heartland Series!